There are a lot of exciting things going on at Honda right now, with several models rated at or toward the tops of their segments and many new or redesigned models coming out over the course of the next few years. 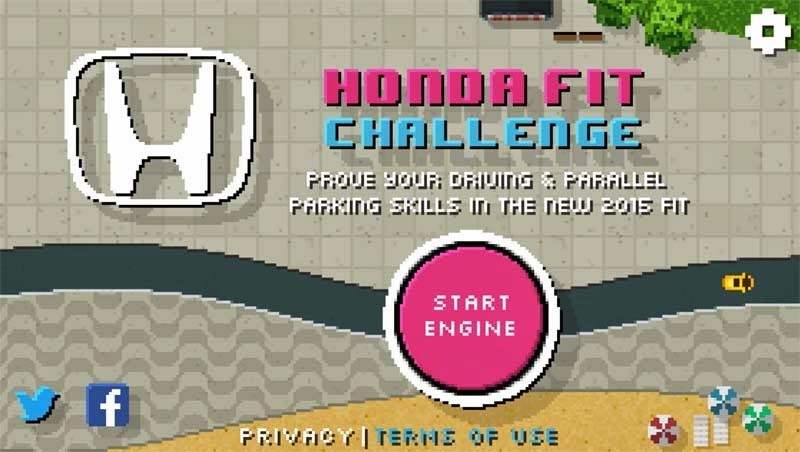 The 2015 Honda Fit, however, is one of the vehicles that we here at Pacific Honda are having the most fun with at the moment, and based on the Honda Fit Challenge, it sure likes Honda is having a lot of fun with it, too. 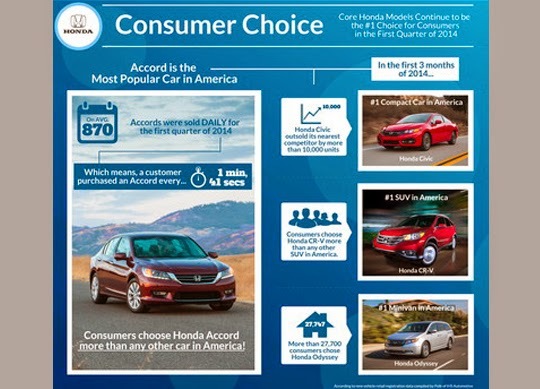 Accord is leading in the effort to repeat its 2013 performance as the most popular new car with individual American car buyers. Through the first three months of 2014, four of Honda's five top-selling models – Accord, Civic, CR-V and Odyssey – each led their segments in retail registrations for the first quarter of 2014, according to a Honda analysis of new vehicle registration data from IHS Automotive. 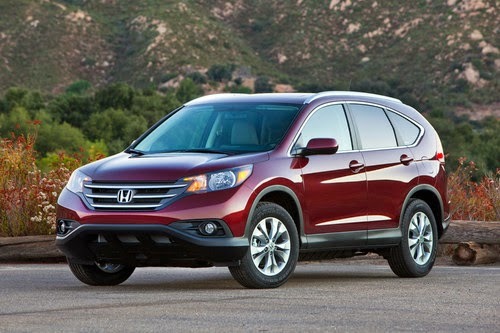 Excluding full-size pickups, the Accord, Civic and CR-V held three of the top five slots – first, third and fourth, respectively – in registrations among individual car buyers in the first quarter of 2014. 1Based on model year 2012 fuel economy data from the U.S. Environmental Protection Agency and its report: "Light-Duty Automotive Technology, Carbon Dioxide Emissions, and Fuel Economy Trends: 1975 Through 2013." 2Based on the number of models by automotive brand that earn a TOP SAFETY PICK or TOP SAFETY PICK+ rating from the Insurance Institute for Highway Safety for model year 2014. 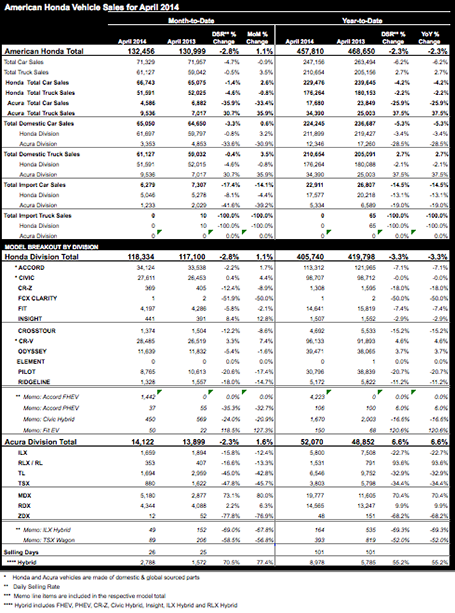 3Longevity based on IHS Automotive, Polk U.S. vehicles in operation registration statistics 1988-2012 for Honda and non-luxury competing brands. Honda Performance Development is pleased that it has been selected to supply Honda's production 2.4-liter, four-cylinder Honda K24 engine to power the new Formula Lites chassis being produced by Crawford Composites for a new racing series promoted by High Performance Group. Formula Lites is a new professional racing series, headed by motorsports veteran and HPG principals Dennis McCormack and Ryan Arciero, and sanctioned by SCCA Pro Racing. Scheduled to launch at select events in 2014, with a full schedule of events planned for 2015, the series is aimed at developing young, professional drivers. "We couldn't be more impressed with this Formula Lites car and their plans for the series," said Jeff Barrow, HPD manager, commercial motorsports. "In working with HPG and Crawford Composites, it was their goal to keep costs down and reliability up. I'm happy to say that our production Honda K24 engine will meet their requirements for cost and reliability, and at the same time provide great power to this fantastic looking car. I would expect that many of our current Honda Racing Line participants would love to get behind the wheel of one!" Created by a design team led by Crawford Composite's Andy Scriven at the company's Denver, N.C. headquarters, the Formula Lites carbon composite chassis is built to current FIA Formula 3 technical regulations, including state-of-the-art electronics and an in-house designed paddleshift transmission system. "Crawford Composites is absolutely delighted to have one of our long-standing partners, Honda Performance Development, providing the engines for the new Crawford FL15," said Max Crawford, president of Crawford Composites. "HPD produces some of the top engines in motorsports, and their long-standing commitment to auto racing has been tremendous. Together, the Crawford FL15 will be exceptionally affordable and, at the same time, a high tech vehicle enabling young drivers to continue to elevate their racing skills in the new Formula Lites series." Series organizer High Performance Group is headed by racing veteran Dennis McCormack, who began his motorsports career in 1968. Working his way up through the ranks as a mechanic, crew chief, team manager and eventually an Indy car team owner with the formation of McCormack Motorsports. "We are pleased to announce HPD as the official engine supplier to the Formula Lites series," said Dennis McCormack. "HPD is a leader in motorsports development and has a history of promoting grass roots racing. Their commitment to Formula Lites will give drivers an opportunity to take the next step in professional racing." More information on the Formula Lites Series and the Crawford FL15 can be found at www.formulalites.com and on FaceBook at https://www.facebook.com/pages/Formula-Lites/298281660322794. HPD was founded in 1993 as the performance arm of American Honda Motor Company. 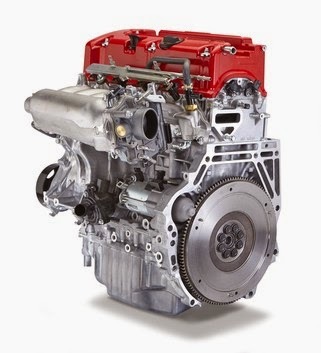 Today, HPD offers a line of race engines for track applications from karting and Quarter Midgets up to Indy cars and prototype sports cars; and showcases "fun to drive" products for professional, amateur and entry-level efforts. 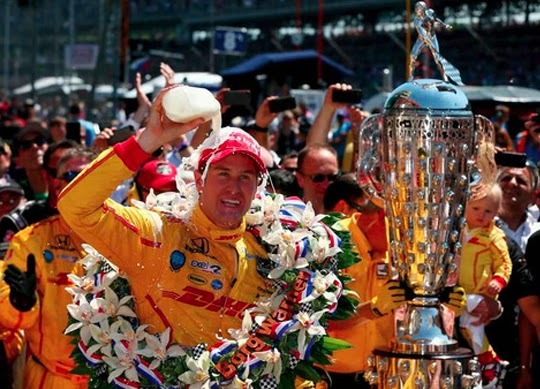 No other manufacturer has matched Honda's success in IndyCars, which includes 205 race victories, 15 drivers' championships, six manufacturers' championships and nine consecutive Indianapolis 500 victories (2004-2012). In 2013, Honda powered veteran Scott Dixon to four race wins and the 2013 IZOD IndyCar Series championship; and Tristan Vautier to series Rookie of the Year honors. HPD's prototype racing efforts have resulted in more than 70 victories and multiple American Le Mans Series engine, chassis, team, and drivers' championships.The company's sports-car racing debut in 2007 at the 12 Hours of Sebring marked the first win for HPD's LM-V8 engine and the first for a Honda racing engine designed and developed outside of Japan. HPD won the LMP2 title in the inaugural 2012 World Endurance Championship and since 2010 has twice won the LMP2 category at the 24 Hours of Le Mans. In 2013, HPD and Honda again swept the LMP1 and LMP2 manufacturers', engine, team and drivers' championships in the American Le Mans Series; while HPD-equipped Strakka Racing claimed the LMP1 private team class win at the 24 Hours of Le Mans. HPD participates in competition on both two wheels and four. The company offers a complete line of race and crate engines. Its customers range from grass roots to pinnacle motorsports. For more information about HPD and the company's racing and street performance product lines, please visit http://hpd.honda.com. Remember when Hollywood stars Diane Kruger (Inglourious Basterds) and Joshua Jackson (Fringe) took a Mercedes-Benz B-Class F-Cell into Death Valley and "survived" by drinking water from the car's tailpipe? Honda has taken that idea into movie theaters in Australia. The idea, but not fuel cell water itself. Honda H2O logoHonda has created a bottled water brande called H2O, and it's meant to promote the hydrogen-powered Honda FCX Clarity as part of Honda's "clever thinking" campaign. The headline message, just as it was for Mercedes, is that a hydrogen fuel cell car emits nothing but water vapor, which is actually safe to drink. To give movie fans a hands-on experience, Honda Australia filled a number of Palace Cinemas movie theaters with free disposable bottles of H2O water. Of course, since there are only a handful of FCX Clarity vehicles in the world today and it would take a lot of driving to fill up that many bottles, Honda admits that, "if you're holding a bottle of our specially produced H2O water in your hand right now, you've been drinking plain old spring water. If you want to taste the real thing, you'll have to travel to California, Japan or the UK where the FCX is currently available." Of course, why anyone would want to associate themselves with the unending waste that is bottle water, a product that has not proven itself to be any better than good tap water, is beyond us. But that's what Honda is doing, as you can see in the promotional video about the stunt. 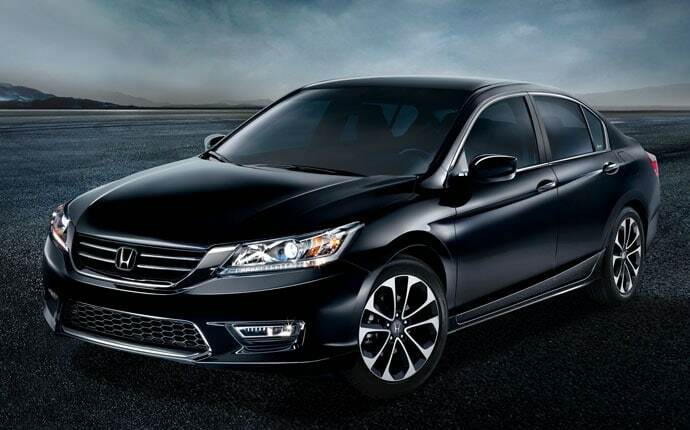 For years, the Honda Accord has been the single best-selling model of car that we’ve sold here at Pacific Honda, but when you build a midsize sedan that not only connects with your customers but also holds up extremely well over time, great sales are almost sure to follow. Today, the 2014 Honda Accord is holding up that strong tradition by remaining one of the most respected automobiles in the business. 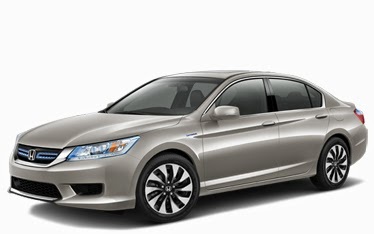 Not that the general public isn’t aware of this, but we thought it would be nice to list some of the major accolades that the newest version of the Accord has won over the course of the last several months, just to prove that it isn’t just the name and the legacy selling these vehicles; the sedan itself is still earning awards. 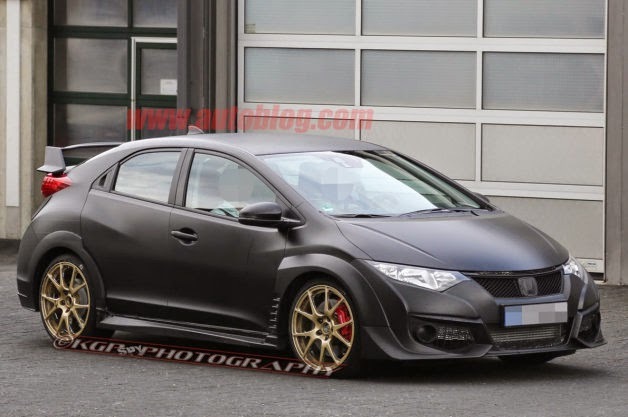 Honda's upcoming Civic Type R is one of our most anticipated models of the next year – and we probably won't even get it in North America. And yet, each time we see it, the five-door just seems so menacing and purposeful. An all-but-undisguised version has just been spotted by our photographers testing on the back roads in Germany. If this signals what to expect, then the project appears to be coming along nicely. Compared to the concept shown at the Geneva Motor Show, this prototype looks even meaner. Check out those big, blistered front fender extensions, taller wing, deeply sculpted front air dam and 10-spoke gold wheels. The Type R certainly certainly isn't hiding its performance intentions, and it has no reason to. 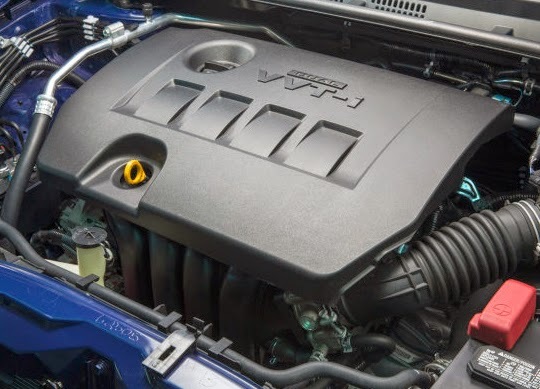 Under the hood, we know it packs Honda's new 2.0-liter turbocharged four-cylinder pumping out 276 horsepower, which is likely connected to a six-speed manual. Now, if only Honda could find some way to get this machine across The Pond and into the our hot little hands. There has already been an online petition begging the Japanese automaker to find a way, and after recently enjoying an all-too-brief prototype drive, we're ready to sign up. Zipcar has been around for over a dozen years, and now shares more than 10,000 cars on a short-term basis with 850,000 members around the world. But there's been one thing missing from the carsharing giant's quiver of options: the one-way rental. That changes today. For a select few in Boston, anyway. "OneWay's Boston launch is so soft that Zipcar says it's not even sure how much it will charge." Zipcar has announced a new one-way carsharing option called (annoyingly) ONE>WAY. This new program soft launches in Boston today, and it's so soft that Zipcar says it's not even sure how much it will charge drivers who use the new service. What we do know is that OneWay exclusively uses the 2015 Honda Fit and will allow drivers to rent by the half hour as they pick up and drop off in two different locations. The standard Zipcar model requires the cars to be brought back to the original location and has a one-hour minimum. At least one membership fee will cover both standard Zipcar and Zipcar OneWay. The introduction of shorter-term, one-way rental may sound a bit like Car2go, the successful carsharing program started by Daimler. Zipcar representatives told AutoblogGreen that it did develop OneWay in response to member demand and that there are two main differences between the two carsharing services. First, since OneWay still uses the traditional reserved-for-Zipcar parking spot method (new ones will be established for OneWay), there will always be a guaranteed space when you arrive at your destination. Second, the Fit has a lot roomier than the Smart ForTwo used by Car2go. To see this point in action, check out the four happy hipsters in Zipcar's new ad for OneWay below. There are currently other Fits in Zipcar fleets in other cities, but the specially branded vehicles in the Boston trial program will need to be used with the OneWay vehicles. That means, for now at least, that users will specify a pick-up and drop-off location before renting the vehicle, said Kaye Ceille, the president of Zipcar. The 30-minute minimum might also someday be changed, depending on user feedback. There's a lot up in the air right now, but Zipcar did say that despite the fact that OneWay is intended for short trips and has reserved parking, the Fit EV will not be involved. That car simply doesn't offer the cargo flexibility that the standard Fit does and some of the reserved parking spots will be on the street, where putting in a charging station isn't feasible. Ceille told AutoblogGreen that, "As we learn the complexity or ease [of OneWay] over the next few months, that will determine our roll-out schedule." She admitted it would be to Zipcar's benefit to get OneWay rolling in every market, but it's just to early to know for sure when that might happen. The current plan is to have OneWay fully functional for all Boston-are Zipsters by the fall. For more information, read the press release below. BOSTON - May 2, 2014 – Zipcar, Inc. today announced "ONE>WAY", a new service that will enable members to take point-to-point trips within cities, and to and from select airport locations. The new service, currently being tested and slated to launch in select markets later this year, will exclusively feature the Honda Fit, the fun-to-drive, fuel-efficient and versatile subcompact that is small enough to zip in and around cities, yet large enough to comfortably fit up to five people and their gear. Honda's role in the Zipcar ONE>WAY service continues its long legacy in car sharing dating back to the introduction of its Intelligent Community Vehicle System (ICVS) concept in 1994. 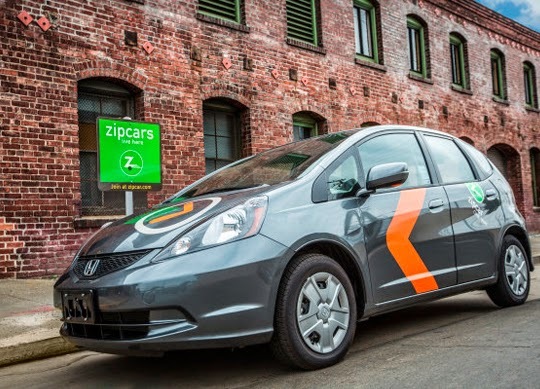 The new Zipcar ONE>WAY service will enable members to reserve and pick up a Honda Fit Zipcar at a designated location and drop it off at another with a guaranteed parking spot. Zipcar's new service not only benefits members through increased flexibility, but also helps reduce congestion in cities as members are not circling the block searching for parking. Zipcar ONE>WAY, combined with the company's industry-leading round-trip model, will offer members the most comprehensive mobility option available. "Our ONE>WAY service blends the best of Zipcar – guaranteed parking and advance reservations – with the best of the one-way model – spontaneity and the freedom to leave a car in a different location," said Zipcar President Kaye Ceille. "Zipcar ONE>WAY, combined with our global fleet of more than 10,000 vehicles with 30 different makes and models, offers members the most options, the most flexibility and the largest global network of any mobility provider." The all-new 2015 Honda Fit has become even more of a standout choice in the subcompact segment with its small-on-the-outside exterior and big-on-the-inside interior passenger and cargo space. Available through Zipcar ONE>WAY later this year, the 2015 Fit features a fresh and modern design, a powerful and efficient engine, plus a highly versatile interior loaded with standard equipment essential for urban driving like a rearview camera and Bluetooth® hands-free connectivity. The surprisingly roomy 2015 Fit interior provides an impressive 95.7 cubic feet of passenger volume with comfortable seating for up to five passengers with ample storage space behind the rear seats. For enhanced versatility, the Fit is equipped with the Honda-exclusive 60/40 split rear Magic Seat® which offers multiple seating and cargo-carrying configurations to accommodate long items up to eight feet long or tall items like plants. With its one-motion dive-down functionality, it can fold flat into the floor to provide nearly 53 cu-ft. of rear cargo volume. That's more cargo area than the average SUV, offering enough space to allow for 10 carry-on sized suitcases. On top of its superior cargo capabilities, the 2015 Fit is a class leader in fuel efficiency with an EPA fuel-economy rating1 of 33/41/36 for the LX trim with a new Continuously Variable Transmission (CVT). "Created for urban mobility, the Fit subcompact and Zipcar ONE>WAY service will offer Zipsters the best of sustainable city transportation in a functional, stylish and fuel efficient package," said Steven Center, vice president of the Environmental Business Development Office at American Honda. "Honda has long been involved in the car sharing industry, and we believe that this program will help reduce emissions and city congestion while providing a new level of freedom and convenience to customers." "This combination of roominess, flexibility and fuel efficiency makes the Fit a perfect fit for our One>Way service," continued Ceille. "With this initiative, we build on a long and successful relationship with Honda, whose leadership in sustainability and engagement with the car sharing industry during the past decade has helped accelerate the growth of the car sharing category." Honda offers a complete lineup of fuel-efficient cars and trucks through a network of more than 1,000 dealerships in the United States. Honda has more than 30 years of experience producing automobiles in the region, which began with the Accord in Marysville, Ohio, in November 1982. Having produced nearly 27 million vehicles in North America through 2013 using domestic and globally sourced parts, Honda currently operates 15 major manufacturing facilities in North America, producing a wide range of Honda automobiles, all-terrain vehicles, power equipment products, engines and transmissions. The 2015 Fit will be manufactured for the first time in North America at the new Honda plant in Celaya, Mexico. With the introduction of the new manufacturing facility in Mexico, Honda's North American automobile production facilities will have a total annual capacity of 1.92 million units, with the capability to manufacture vehicles in all product segments, from subcompacts to light truck models. 1 Based on 2015 EPA mileage ratings. Use for comparison purposes only. Your actual mileage will vary depending driving conditions, how the vehicle is driven and maintained, and other factors.